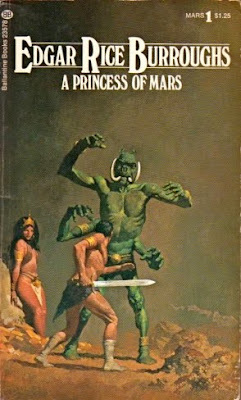 A Princess of Mars, published in 1912, was the first major success for Edgar Rice Burroughs. It was the first of his many Martian or Barsoom novels. John Carter is a gentleman of Virginia in the period just after the American Civil War who suddenly finds himself on Mars. Early science fiction writers came up with all sorts of fanciful methods of transporting their heroes to other planets. Burroughs solves the problem very simply but in a manner that cleverly leaves as many options as possible open for sequels. This was something that Burroughs did habitually but it’s interesting to see him doing it in such an early work. John Carter has a kind of out-of-body experience in a remote cave and then wakes up on Mars, which he will soon learn is known as Barsoom to its inhabitants. Life on Mars faces many difficulties, most especially the scarcity of water and the precariousness of the atmosphere which can only be maintained by artificial means. Mars was not always like this but it has been for millennia a dying planet, the home to dying civiisations. This is one of the earliest examples in science fiction of the dying world. Although Barsoom is not quite dying - the Martian civilisations had developed very sophisticated technologies, technologies that still function despite the decline of the civilisations that gave birth to them. The air and water supplies remain stable as long as the technology functions. Barsoom is home to several vaguely human-like creatures. There are the giant white apes about which we are told little. And there the Green Martians, described in great detail. They are the first Martians John Carter encounters, human-like in some ways but with six rather than four limbs and with tusks. They are intelligent but savage. Their society is a militaristic communistic society. Duels to the death are an everyday occurrence. Green Martians laugh readily but their laughter is always provoked by cruelty, violence and torture. Their offspring are raised communally and without any real family life they have become vicious and violent. They are not all bad though and John Carter will form surprising friendships with several of these green men and women. The third group of human-like creatures are the Red Martians, very much like humans apart from the fact that like all the human-like inhabitants of the planet they are egg-layers. Their skin has a pronounced reddish hue, just as the skin of the Green Martians has a greenish hue. John Carter discovers he has one huge advantage over all the Martians - being from a planet with much stronger gravitational forces than Mars he is much stronger than they are, and much more agile. This will not only save his life but also earn him recognition as a warrior and leader. He finds love on Mars, with the beautiful Red Martian princess, Dejah Thoris. He also finds himself in the middle of several wars, unsurprising since Barsoom’s inhabitants are addicted to war. Burroughs had a gift for creating imaginary worlds that are truly alien - worlds where the physical, biological and social rules are quite different as compared to our world. In Pellucidar (the world inside the Earth) for example gravity is inverted. On Barsoom the continued existence of an atmosphere is dependent on machines. He had an equally strong gift for telling entertaining stories and A Princess of Mars is a great deal of fun.